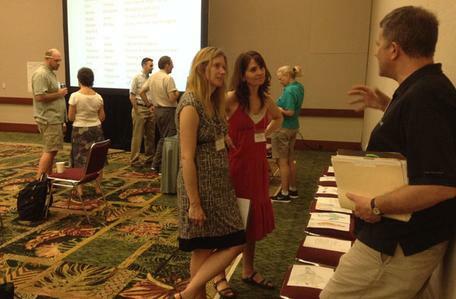 In conjunction with the 2014 Ocean Sciences Meeting co-sponsored by ASLO, AGU, and TOS. Sunday, February 23, 2014, 9:00 a.m to 4:30 p.m. This workshop has already taken place. Please see the Agenda and Participant List pages for more information about what took place. This workshop will explore successful models for teaching oceanography topics to non-majors at community colleges. It will focus on tested models and strategies for effective teaching. Potential topics for inclusion are using on-line data, the role of visualizations and in-class lecture demos, interactive activities, active learning, and research opportunities. It will also include a discussion of student learning outcomes. Participants will be given an opportunity to share resources.